Seriously, get your behind off the couch and start moving around. Maybe do a little more than just moving around, that can help you shed some pounds. It is a proven fact that losing excess fat can help you with your snoring. So, the next time you catch yourself slouching on the bed having chips, throw the chips and get some cardio. 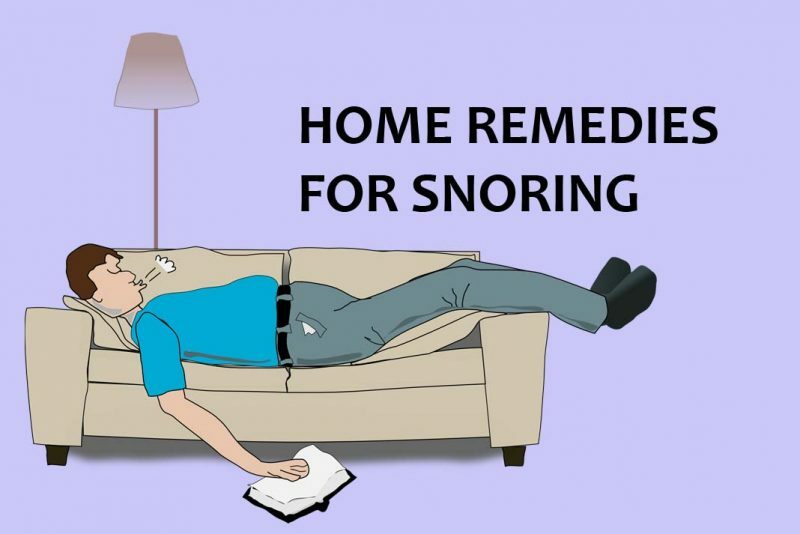 Now, this might sound like advice for redecorators, it certainly is a home remedy for snoring. There are bacteria on your pillow-case and they cause allergies in your nose. It is as simple as that. So, take out your purse and go pillow shopping. For all those booze-loving people out there, we have some bad news. You’ll have to seriously cut down on the late-night booze and start drinking water instead. Alcohol will exacerbate your snoring and make it even worse. Sorry folks. Change is the only constant, right? So, change your posture in bed every now and again. This weird hack will definitely help to reduce the snoring. If you normally sleep on your back, try sleeping on your side. Yoga is a tried and tested method to completely eliminate snoring. The nasal exercises can do wonders in clearing your nasal cavity. So, wake up early, take a deep cleansing breath and breathe your way to a sound sleep. You can do some throat exercise as well. This is not about hygiene. Taking a hot shower before bed can help clear any blockages in the nasal cavity. Plus, you’ll smell great before bed. Win-win! Now, this might seem a little strange since this is a home remedies article. But this becomes necessary if your snoring is severe. These oral appliances keep your air passage open, making it easier to breathe and thus preventing snoring. Speaking of oral appliances, there are a plethora of them out there; so many, that it can get overwhelming to choose from. Also, in the face of such diversity, it is very easy to fall prey to scams. So, choose something that is not only easy on the pocket but also totally genuine and is backed by positive reviews from real users. It’s very tempting to pop a few pills right before bed especially if you’ve had a bad day at work and your boss drove you crazy. But take a chill pill and not a sedative because it causes you to snore even more and sleep less. It is completely counter-productive since you took those pills for a sound sleep in the first place. Sometimes the most effective remedy can be hiding in plain sight in the kitchen. Something as ordinary as turmeric or garlic can help treat snoring better than anything else. This might sound super bizarre, but it works. Research shows that sleeping on your back can put pressure on your throat, causing it to make breathing difficult. The quick fix to this is sewing a tennis ball to the back of your t-shirt which will compel you to sleep on your side. Genius, isn’t it? Continuing on the ‘bizarre’ trend, here’s another one. This one doesn’t require you to be flexible so don’t fret. Only your tongue has to flexible, which it already is. Tongue exercises work wonders with snoring. Pro tip: Do it when you’re alone. It’s not pretty to look at if someone catches you. Peppermint oil is known to open nasal passages and shrink the throat tissue that contributes to snoring. Massaging your nose with some peppermint oil might be the solution if all else fails to deliver results. Plus, it smells great! Some evidence shows that regular singing might help people who snore. It is also known to tone the muscles at the site of snoring’s origin. This one’s yet to be backed up by larger studies, but it is at least fun. Or not, if you’re a bad singer. This is by far the most bizarre hack for preventing snoring. But it is backed by some pretty convincing scientific explanation. So, this trick is applied by people in long-haul flights to prevent blood clots. But it so happens that it can also address obstructive sleep apnea (OSA). A study shows that people who wore flight socks during the day were less likely to have their sleep affected by OSA. So, try these at home and get in all the beauty sleep you need because you deserve it.